Tutorials provide step by step instructions on a variety of subjects. Screenshots provide step by step views of account creation, program features or other areas of interest. 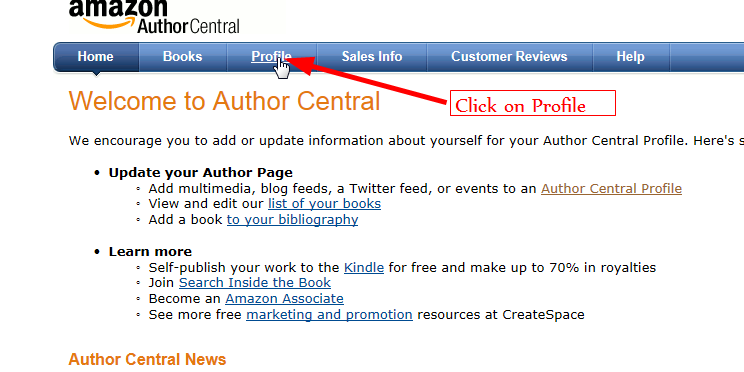 For those looking to expand their marketing potential, meet Amazon’s Author Central. I mentioned this service before but I myself never had any time to see how it works until now. So, I thought I would set up a bit of a tutorial and tour of Amazon’s Author Central for all who write so that we can find out what it does? And how it can help increase sales? On the profile page you can add a ton of different things such as your biography, blogs, events, photos, videos and twitter. Biography: allows you to customize what information appears on the Amazon page where your book is listed. Blogs: allows you to add your Blog’s RSS feed. If you’re not sure what RSS is, basically it is:RSS (most commonly expanded as Really Simple Syndication) is a family of web feed formats used to publish frequently updated works—such as blog entries, news headlines, audio, and video—in a standardized format. It allows people to know what your recent posts are and gives them updates based on their subscription options. Setting up RSS is very simple, I personally like Feeburner. It is now part of the Google empire and can be created by following the steps here. You do need a blog or website in order to have content for RSS as it distributes what you post. It also integrates tweets. If you don’t have any of these services, consider creating a free blog and then set up an RSS feed to go with it. Many free blog services allow you to migrate to a permanent site if you choose to do that later, in my opinion it is better to have ‘something’ that people can find online about you regardless of how simple it is. Events: you can post appearances, engagements, whatever right on Amazon which is very neat! Finding out where authors are going to appear can be a big generator for interest as keeping yourself visible is good for creating fan base. Author Page URL: this is the page created by Amazon where all your information will appear! I would suggest that authors who have an author page at Amazon add that when mentioning where they are ‘visible’. Creating a ‘signature’ on all your profiles and in your email program can be very useful for this because you can add the url in your signature for further advertising! Just make sure you advertise where you are and provide links. Afteryou finish all of these steps you can see the finished page when you click on the Visit Amazon’s (Author Name) Page, although there was a bit of a delay in viewing all of the changes so it might take a few minutes. There is also a ‘discussion’ area for authors. I would caution people though if you do use that remember it is ‘public’ and therefore whatever you state on there is visible to anyone who might want to buy your book. All in all it was fairly easy to set up the account, customize it and see it all finished, and I would say that this service could be very beneficial to authors who want to increase the information provided on Amazon and increase the chances of getting fans interested in you which is a big part of book publicity.